We just got great news that the film my boyfriend, Matty Steinkamp, and I made called Play The Documentary, will be screening as an official selection at the Phoenix Film Festival April 9, 10, and 14! This calls for celebratory breakfast and nothing says "hooray!!" quite like homemade waffles. Please visit PlayTheDocumentary.com to learn more about this exciting film to inspire people to play music and recognize the importance of music education in public schools. I am a total newbie to waffle making but for the New Year I bought myself a cheapie waffle iron to fulfill my dream of delicious homemade vegan waffles. Since then I've made a few delicious batches but I always make too much batter. 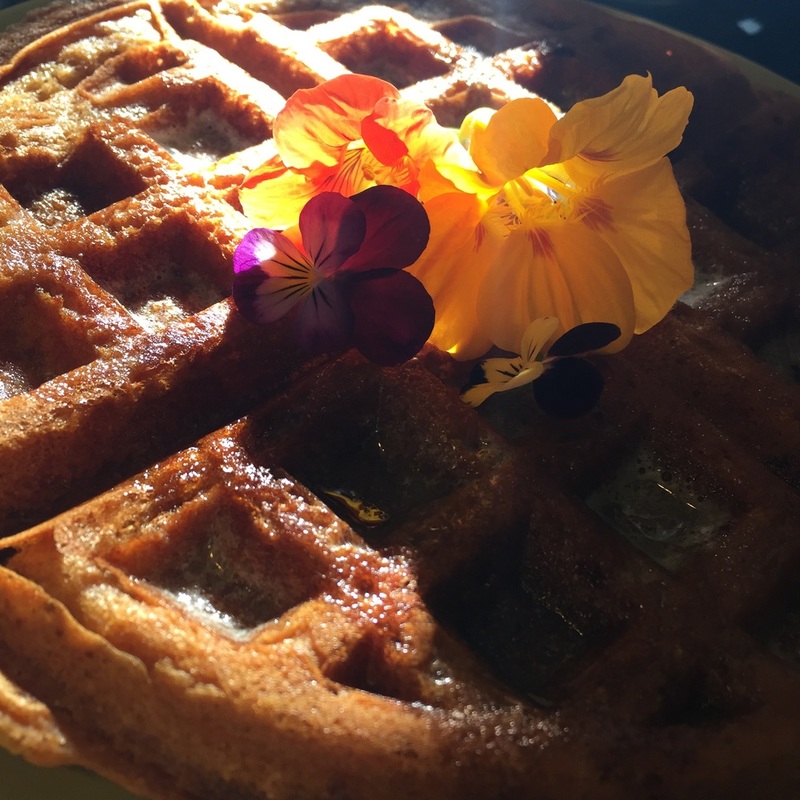 I reigned in my tendency to cook for a vegan army and made some celebratory waffles for two! Heat up your waffle iron. Whisk together your liquids, be patient, the malt barley syrup is super gooey but worth the wait. Once combined add the flour, starch, baking soda, and salt, whisk gently until combined (some lumps are fine, you don't want to over mix or the waffles get tough). Pour about one cup batter on your 6 inch waffle iron, following the manufacturers directions. Mine take about 10-12 minutes on medium heat then I switch to high heat for the last couple minutes to crisp up the outside. Generally, waiting until your waffle stops spewing steam is the best way to see its done or almost there. 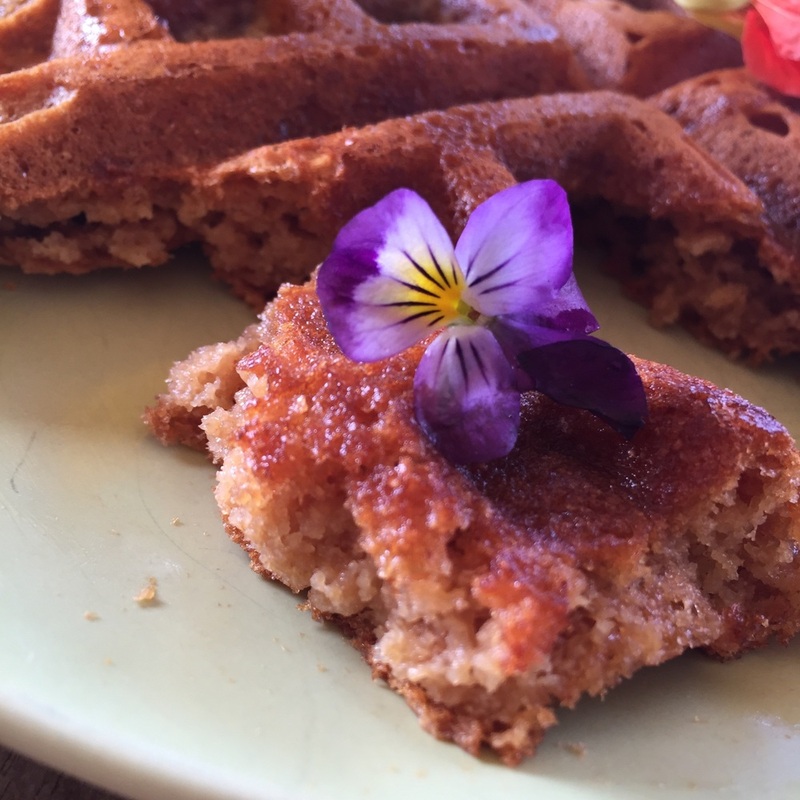 Gently remove your waffle, smother in earth balance and maple syrup and sprinkle with edible flowers. Happy celebrating! Preheat the oven to 350 and line a baking sheet with wax paper. Mash your nanners, mix in the maple syrup and almond butter (I love the Trader Joe's brand), until smooth, fold in the whole wheat flour until fluffy then toss in your crushed up chocolate bar. Spoon onto your baking sheet in a cookie-ish shape (they won't move much or rise too much). Bake 12 minutes then put on wire wrack to cool 10 minutes. You're going to want to eat them all and they have good protein (3G/cookie) and fiber so I won't judge. 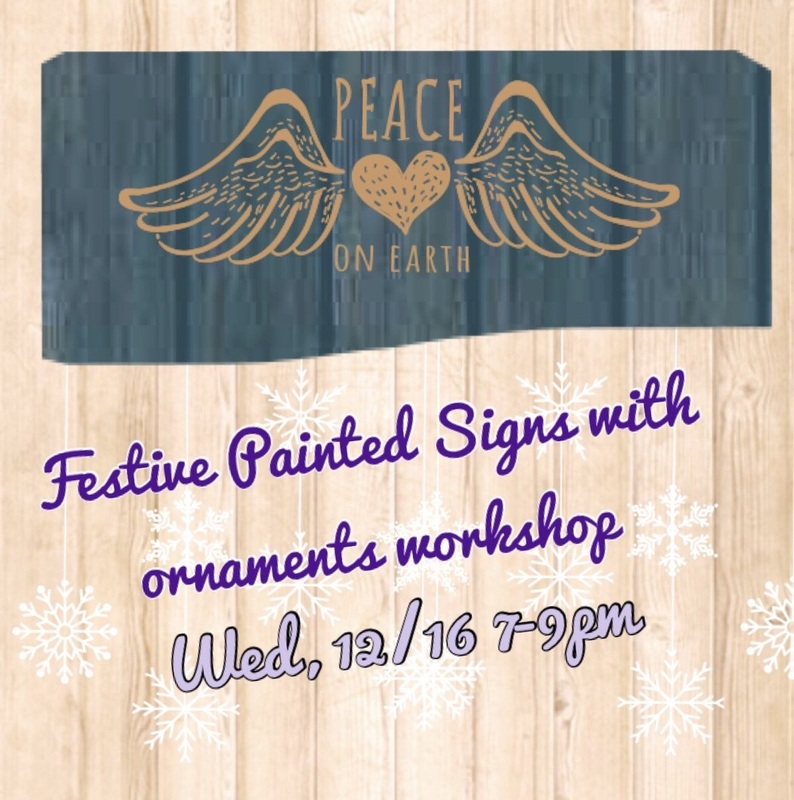 Join us for Holiday Workshops! I'm so excited to have the new round of workshops available! We start this Wednesday with some basic herbal lessons for wellness. Come make Fire Cider to boost your immunity and Elderberry syrup to sooth cold symptoms and speed healing! You will get these two take homes plus loads of great info on other herbal techniques including nourishing infusions and tinctures. 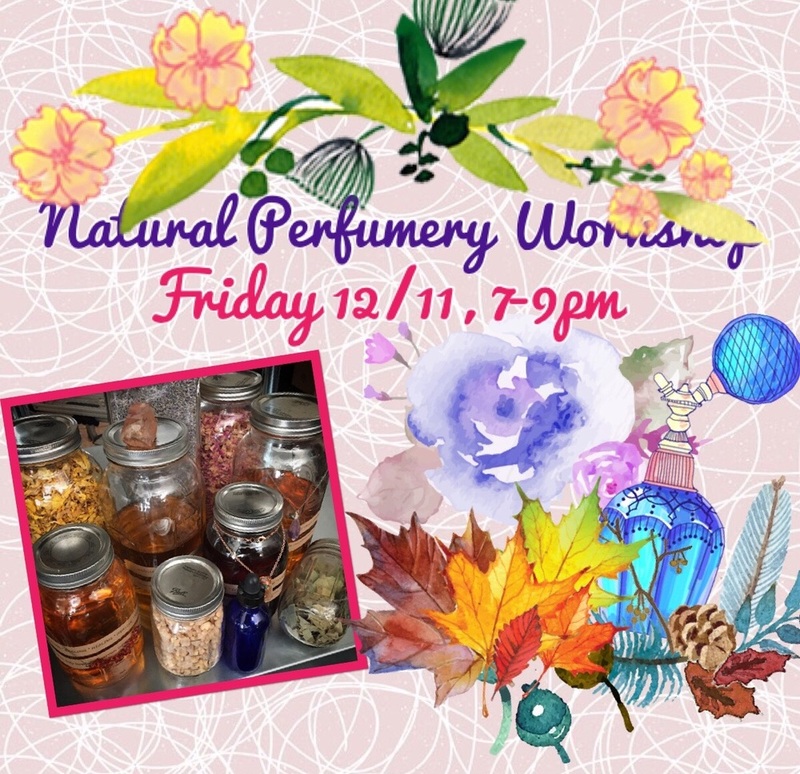 This Friday I am bringing back one of my all time most requested workshops, Natural Perfumery! We will learn about making your own extracts, essential oils and their various benefits as well as blending techniques and dilutions. 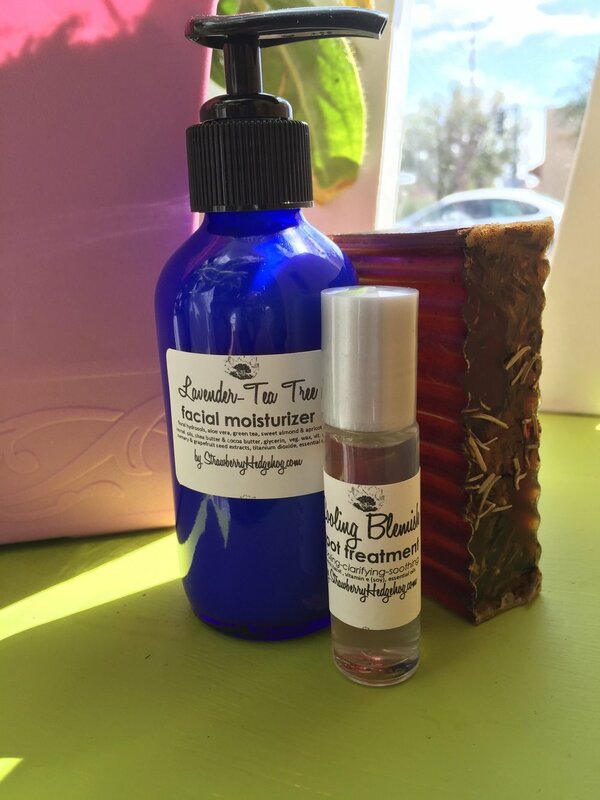 You will have access to my wide range of essential oils and leave with your own roll on and solid toxin-free custom perfumes! Your Holiday decor is lacking without your handmade painted sign with adorable ornaments hanging from it! Join us for a fun and relaxing evening of painting with artist, Stacey Newlon, vegan snacking and tasty beverages by Strawberry Hedgehog and all of the aromatherapy your heart desires. Last but not least of the holiday workshop whirlwind is the Gifting From Your Herbal Kitchen workshop! 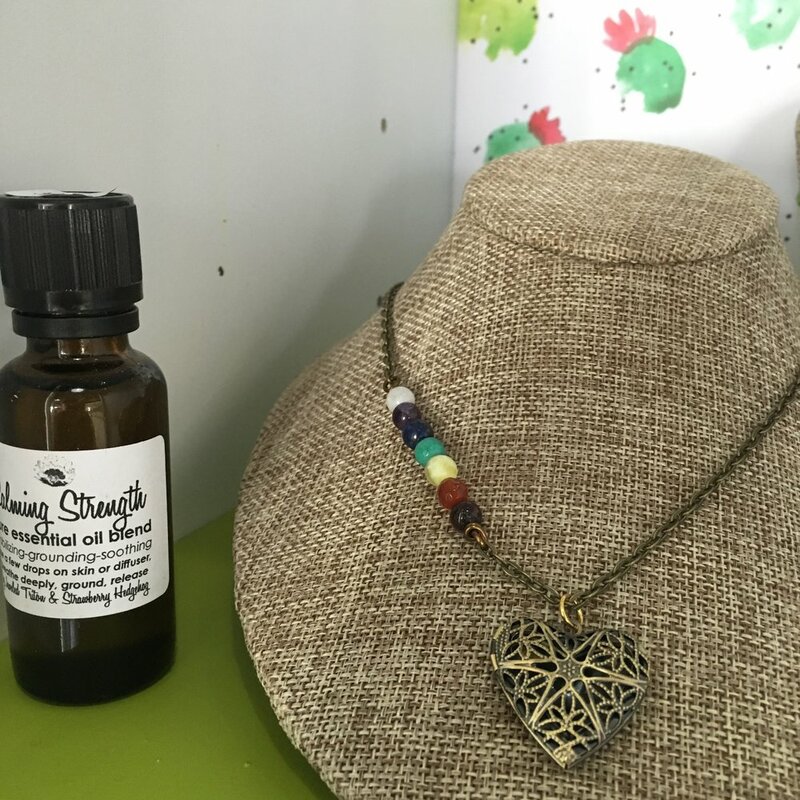 Learn how to make heart felt and healing gifts from your kitchen, you will bring two items home that you can easily reproduce for gifting to friends and family! I'm trying to up my in take of broccoli for its high protein and antioxidant powers. Here is tonight's broccoli packed creation. Sautee onion, celery, ginger, and other spices in a bit of canola oil until onion starts to get translucent. Add broccoli and soy sauce and pour boiling water to cover. Place noodles on top and cover, let simmer and steam a few minutes until they start to soften. Fold veggies and noodles together, top with carrots and almonds and cover again about five minutes so liquid soaks into noodles and reduces. Add lemon juice, sesame seeds, and drizzle of sesame oil before serving. It has been chilly the last couple days so I decided we needed some serious comfort food and this tater soup exceeded expectations. Enjoy! Sauté the onion, carrots, celery, and garlic powder in a couple Tbsp olive oil with a pinch of salt until onions are transparent. Microwave golden taters about 8 minutes then cut into eighths and put into the veggies. Pour enough boiling water In the pot to cover it all, add spices and let it simmer about 15 minutes. Stir in sauerkraut and add salt and pepper to taste. Garnish with fresh herbs and pat yourself on the back for your culinary victory! Tis the season to bring the soap to you! 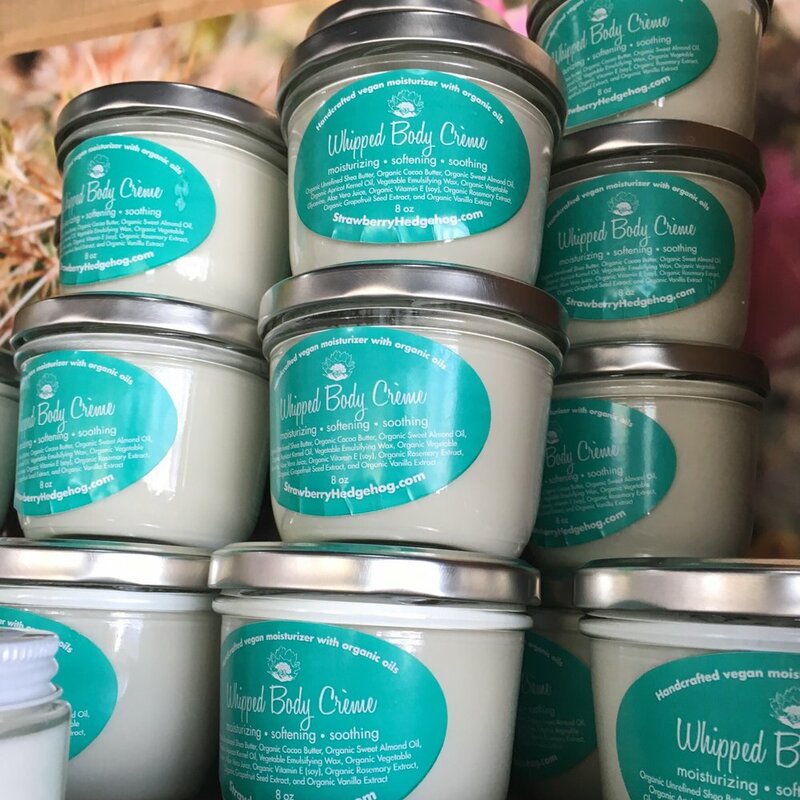 We will be out and about spreading the good word of cruelty free, toxin free soapage! Hope to see you at these fabulous upcoming events! 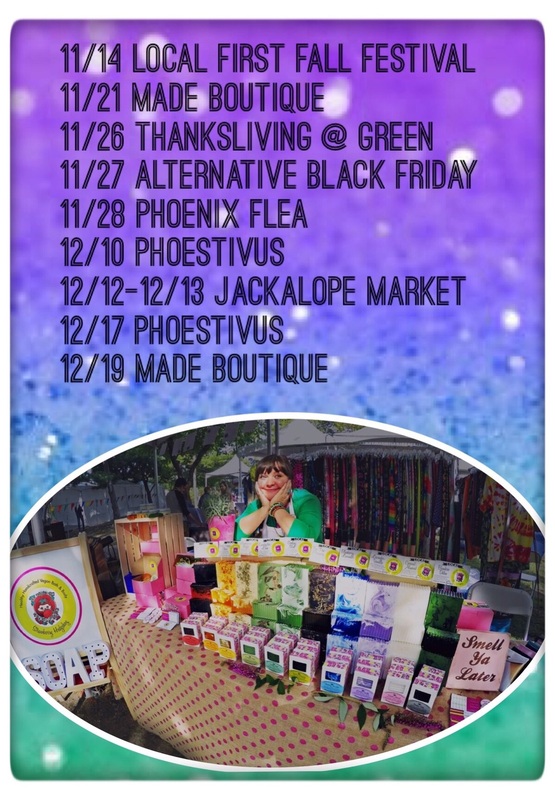 Come find us at one of the many events we will be at or stop by the Soap Shop! I came across some edamame gluten free spaghetti at CostCo and it sounded too good to be true. 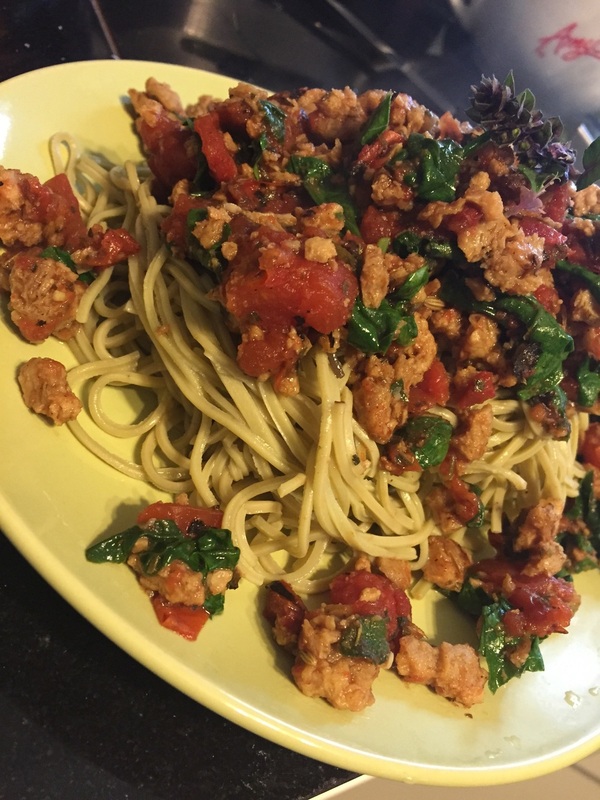 20+ grams of protein per serving, no wheat, and the noodles are my favorite color, green! Win! the texture was chewy and unusual but I LOVED it! I can't wait to play with different sauces. Bring the water, soy sauce, and dry spices to a boil, stir in TVP, remove from heat and cover for 10 minutes. In a frying pan sauté garlic in olive oil on medium heat until lightly brown, stir in tomatoes, and TVP until simmering, add in the fresh greens until wilted. Bring a pot of water to boil with a pinch of salt then put in a handful or two of edamame noodles, boil 4-5minutes, drain, rinse with cool water, return to the pan and gently fold in some Earth Balance. Serve up your noodles on a plate then a scoop of sauce on top. Yum! Soy gets a frustratingly bad rep. Yes, (as with the growing if any modern mono crop) there are environmental impacts of its growth, yes, GMOs are bad, yes, it is in lots of stuff so overdoing it is totally possible. But! In moderation, organic soy is awesome, protein packed, and when properly prepared super delicious and satisfying! Best choice. Tofu is my favorite soy option because it is so versatile. I go for the organic sprouted extra firm tofu. Safeway has a great one, so does Wildwood. They are the type packed in water. This is great for scrambles or slabs. Freeze. One of my favorite tricks for tofu is to freeze it first. Freezing it changes the structure/texture once it thaws, leaving it chewier and more fibrous. When I buy tofu I just throw the entire packs directly in the freezer then take one out when I need it in the AM and it is ready to go by evening. Drain. Squeeze the water out of your tofu (some people suggest pressing but I am too impatient). Hold the thawed tofu over the sink and gently squeeze the liquid out. The spongier texture from freezing lends itself well to this. Then it is ready to go. You can marinade it or go straight to cookin'. Sear, my dear. I love when the outside of my tofu gets a little seared. This is accomplished by using a bit of olive oil and spices and a medium to high temp pan or grill. For this super easy one I just used lemon pepper, Mrs Dash, salt and pepper, and a squeeze of lime for flavor and cooked it for about five minutes per side in a hot frying pan with olive oil. Sauce is boss. Tofu really takes on any flavor you like so when I keep the tofu basic like the above suggestion I like to flavor it up with some sauce. 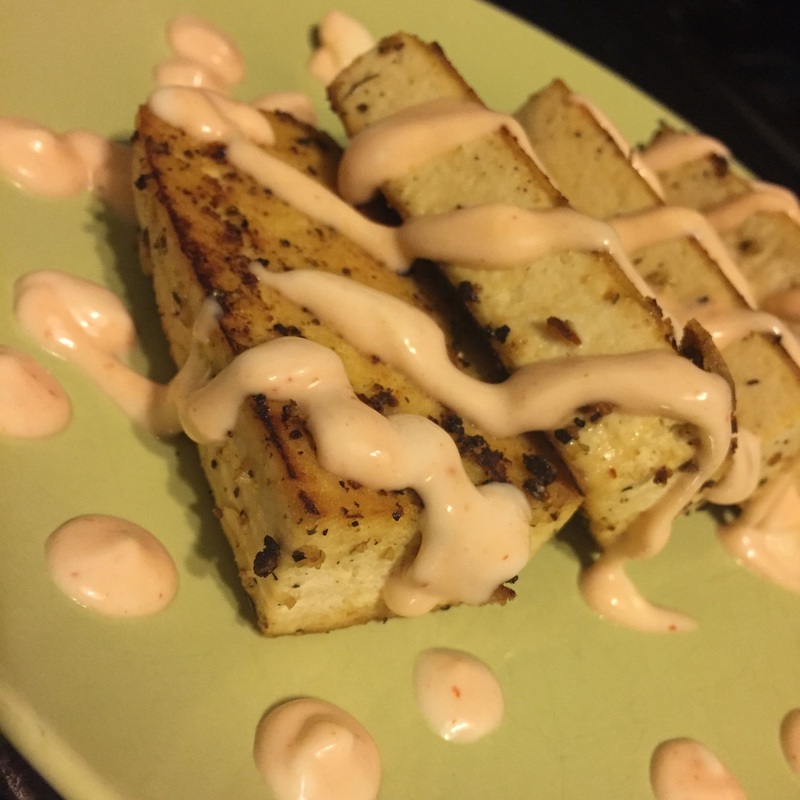 In a baggy I smooshed (technical term) 2Tbsp Just Mayo with a squeeze of lime and 2tsp Siracha, cut the corner off and piped it over my seared tofu. So good! It is my 34th birthday today and I want to celebrate by sharing the love! Please use coupon code HappyBirthday at checkout to take 34% off of your total purchase! Excludes Soap Club. Woohoo! Birthday! I love pickles more than most things. The tangy, salty, sour flavors are so satisfying to me and are something I am always craving. I love cured cabbage on tacos so decided to try my hand at it. I used a basic brine and it turned out delicious! Still crunchy but gets more pickled the longer you let it sit. Stuff your cabbage into large sterilized canning jars. Bring all other ingredients to a boil until salt is dissolved completely. Carefully, slowly, pour hot brine over the cabbage in the jar so it is completely covered. Put your lids on the jar and store refrigerated. Unlike sauerkraut or traditional pickles which take a good amount of time, this is tasty within a couple hours and should be eaten within a couple weeks. Wonderful on its own, mixed with roasted veg (OMG a can of beets mixed in makes a crazy good treat), on tacos, on veggie dogs, you name it! Enjoy. Vegan MoFo - Taco Tuesday! Vegan Month of Food is here! 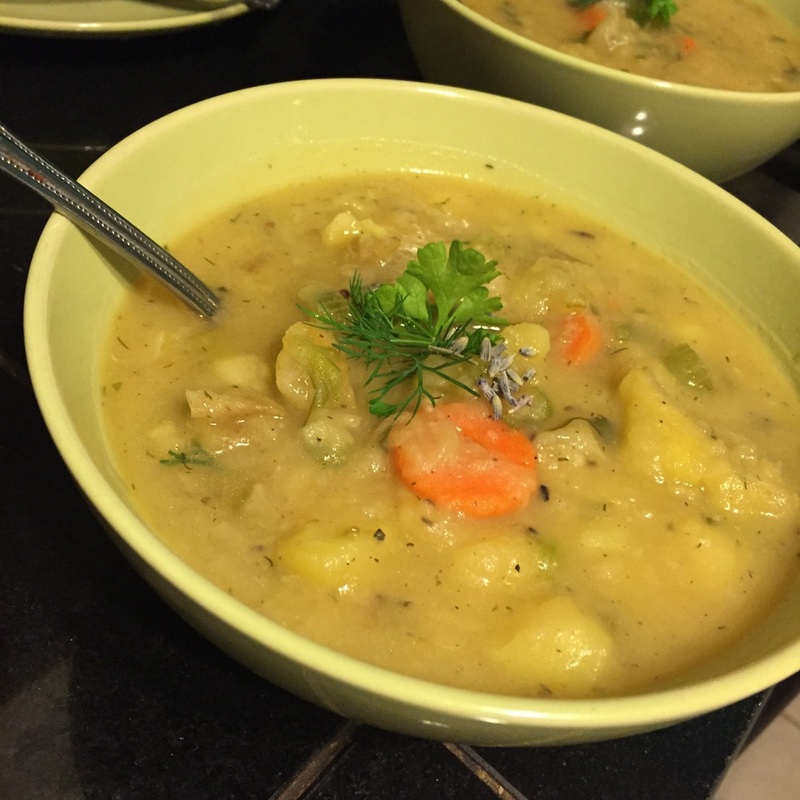 I have gleefully participated in this great recipe-posting occasion in years past and am excited to try to do daily posts again. Here we go! Vegan taco crumbles in the cooler section at the grocery store can cost more than I want to spend for the quantity you get. Texturized Vegetable Protein is available in the bulk herb section at my local Mexican market in a huge bag, sold as Carne de Soya, for $1.99! The only ingredient is soy flour and the size of the crumbles is just right for making tacos, spaghetti sauce, etc. bring water to a boil, add TVP and all other ingredients, cover and remove from heat. Let sit for at least 10 minutes, stir and serve! This is fantastic on hard or soft tacos, taco salads, and nachos. I served it with a cashew lemon garlic spread, lightly pickled cabbage, pico de gallo and avocado on corn tortillas. Enjoy! Tasty enough to please picky (read:omnivorous) tastebuds!